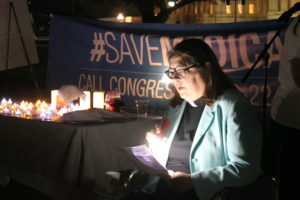 Last Wednesday, NETWORK joined dozens of religious denominations and organizations in a 23-hour interfaith prayer vigil for healthcare. 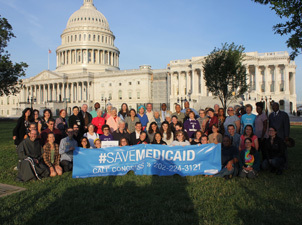 Together we voiced our opposition to the Senate Healthcare bill – the Better Care Reconciliation Act- a bill that makes immoral cuts to Medicaid and would drastically change the lives of millions of people, especially those who are marginalized in our communities. 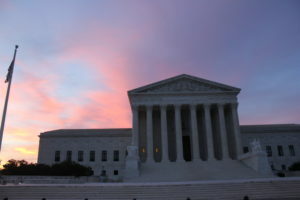 As people of faith, it is our responsibility to fight for and defend the dignity of all people, especially those on the margins of our society, and to advocate for God’s belief in the worth of all people to have an abundant and healthy life. As a NETWORK intern, I’ve been so inspired by the work that faith organizations are doing to advocate for the dignity of all God’s children. These 23 hours were unlike anything I have seen before. I saw pain, passion, and promise. I witnessed vulnerability, I experienced agony and anger, and I felt the fear of what this new healthcare bill could mean for loved ones. For 23 hours, people of different faiths were all united in the mission to love our neighbor and to pray, sing, and speak out against the Senate and House versions of a new healthcare bill. As Matthew 18:20 says, “For where two or three have gathered together in My name, I am there in their midst.” God’s presence was apparent on that Capitol lawn- in the people present, in the stories shared, in the songs chanted, in the prayers cried out, in the silence of the hearts. 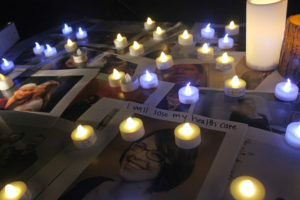 While we were surrounded by various powerful political institutions, the true power that night was on the patch of grass that held the hearts of those advocating for the human right of healthcare. 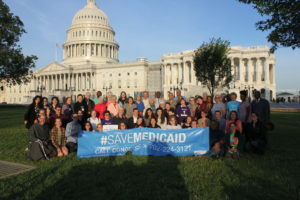 For 23 hours, people stayed awake advocating for Americans who depend on Medicaid coverage for their healthcare. As I sat there hearing story after story of people whose lives will be forever changed by the Better Care Reconciliation Act, it became clear that we are not alone. To those who have or are currently suffering from mental or physical illnesses, and to those who have a loved one who is suffering from mental or physical illness, we stand with you. Never forget your inherent dignity and worth as a child of God. As people of faith, we all stand together, to advocate for our sisters and brothers. We have the power of God’s love and the power of our community, and that is far greater than any institutional power. Despite all the evident pain and fear, hope prevailed. Hope was there when the sun rose in the morning and cast a beautiful sunrise. I was reminded that we are the hope we need, we are the change we seek. That hope, that fire that burned inside all of us is as important now as ever. This fight is far from over. For all of those who feel called, I urge you to keep sharing your stories. God doesn’t call us to be ineffective. God calls us to love our neighbors, to advocate for those who are unable to, to stand up for those who are hurting and suffering. God calls us to be a voice of truth, to speak out against this sinful healthcare bill that will take the lives of thousands of people and change the lives of millions of people forever. As Rev. J William Barber II exclaimed, “Jesus said, ‘When I was sick, you cared for me.’ He didn’t say, ‘When I was sick, you cared for some of me.’” As people of faith, we are called to be truth-seekers. We are called to share our stories. We are called to resist any policy that brings harm to our sisters and brothers. We will not be silent anymore. Brie Baumert is a summer intern with the NETWORK Grassroots Mobilization team. This entry was posted in Emerging Justice Seekers, Healthcare on July 5, 2017 by networklobby.